I was flipping through the Food Network Magazine the other day and stumbled upon The Neelys’ Cherry Tomato Salad with Buttermilk-Basil Dressing. It looked like a picture-perfect summer salad to serve alongside grilled meats or to have as a salad at picnics of any kind. To make it even healthier, a few lighter products were substituted and the results were fantastic. Sometimes for simple recipes like this, all it takes is a couple product swaps to make a healthier difference. Fresh herbs used in salads and dressings help to add flavor without adding fat. A lighter version of a tasty summer side dish. 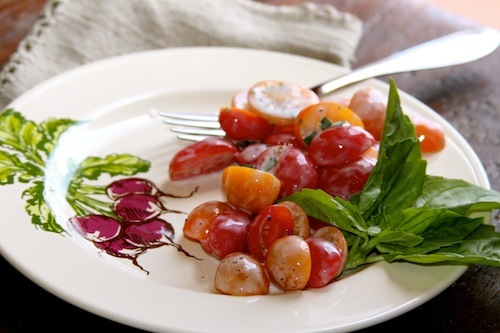 Place the cherry tomatoes in a bowl and season with salt and pepper. In a small bowl, add the buttermilk, sour cream, garlic, chives or green onions, and basil and whisk well. 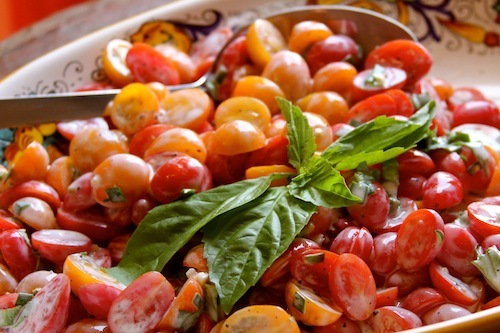 Pour most of the dressing over the cherry tomatoes and toss well to coat, adding more dressing if necessary. Serve immediately or refrigerate 1-2 hours to allow flavors to blend. Garnish and serve.